The cloud mining provider Geneis Mining has started offering Ethereum cloud mining contracts again after they were not available for a couple of months with the focus more on ZCash cloud mining with GPUs. 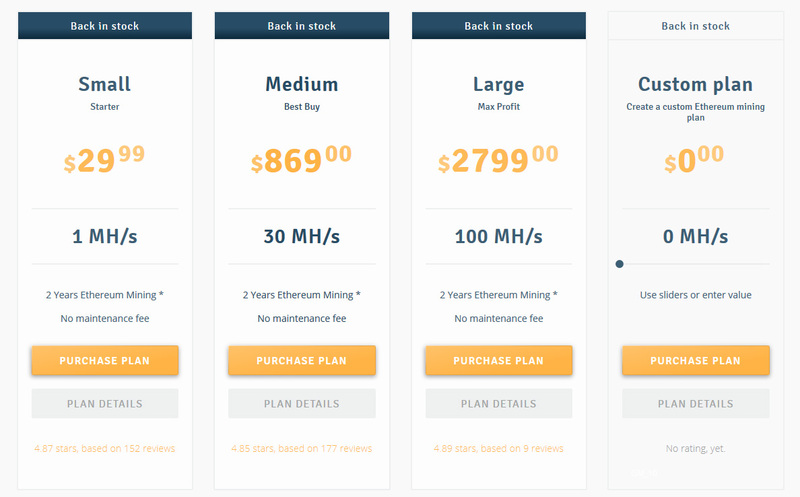 The new mining contracts are available at a lower price and with an extended 2 Years period with no additional mining fees (everything is included in the price you pay for the hashrate). There is of course a clause in the contract saying that in case Ethereum switches to Proof of Stake (POS) before the contract period ends your hashrate will not disappear, but will instead be switched to the most profitable algorithm to mine at that point of time. Initially we expected to see Ethereum (ETH) switch to POS at some point this year, but this will most likely be delayed and no official date for the switch has been announced yet… and the interest and price of Ethereum has been going up lately once more. You can currently get 1 MHS Ethereum cloud mining hashrate for $29.99 USD, 30 MHS for $869 USD of 100 MHS for $2799 USD as a preset packages or any custom hashrate in between with discounts for the more you purchase. The Ethereum cloud mining contracts are with a duration of 2 years and there is no maintenance fee, everything is included in the price you pay for the hashrate. You can also use our special discount code CryptoMiningBlog5 to get some extra discount and get even better price should you decide to purchase an Ethereum cloud mining contract from the company.